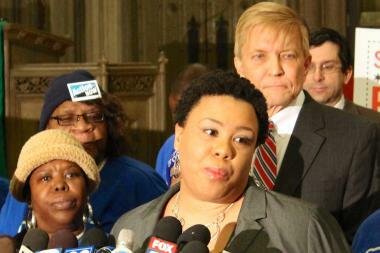 Flanked by Aldermen Toni Foulkes and Bob Fioretti and Action Now President Gloria Warner, Ald. William Burns says, "No person should be forced to work 40, 50 hours and still be stuck in poverty." THE LOOP — Aldermen joined community groups Thursday in supporting a $15 minimum wage for major corporations, though the state chamber of commerce said such a move would "destroy" job opportunities in the city. Eleven aldermen came out in support of an advisory referendum that will be on the ballot in 103 precincts in 20 wards in the March primary, according to Grassroots Collaborative Executive Director Amisha Patel. 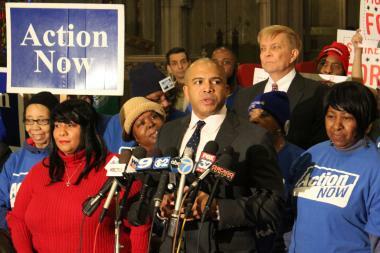 "Raising the minimum wage is long overdue," said Ald. Roderick Sawyer (6th). "We need to give our workers an opportunity to earn a living wage." Citing figures that full-time minimum-wage workers earn $17,000 a year, Ald. William Burns (4th) said, "No person should be forced to work 40, 50 hours and still be stuck in poverty." Burns said that he worked as a teenager at a Chick-fil-A, adding, "We recognize the value in every person's work." Action Now Executive Director Katelyn Johnson says that, with the aldermen's backing, they'll take the results of the advisory referendum to the City Council. Ald. Toni Foulkes (15th) cited her experience working at Jewel and how she had lobbied in previous successful attempts to raise the minimum wage. "The minimum wage is my baby, because I know what it is," Foulkes said. "Raising the minimum wage plays a big part in improving our neighborhoods," said Gloria Warner, an Englewood resident and president of the community group Action Now. "When workers make a living wage they can put money back into the community." Illinois' current minimum wage is $8.25 an hour. Critics say a $15 minimum wage would hurt employment levels in the city, especially for those who are just starting out in the job market. "It would be a travesty especially for the youth of the city of Chicago who are already finding it very hard to find jobs," said Todd Maisch, executive vice president of the Illinois Chamber of Commerce. "A $15 minimum wage will simply destroy a lot of the job opportunities that are out there now. Yes, they can mandate a higher minimum wage, but they can't mandate an increase in revenue that businesses can have," Maisch said. Aldermen supporting the proposal say a higher minimum wage would help a large part of Chicago's population. "Let's talk about middle-out economics," said Ald. John Arena (45th), rather than trickle-down economics. Many supporters said an increased minimum wage would be self-sustaining and not cost jobs, as it would increase spending in neighborhoods. The current minimum wage is $7.25 nationally, $8.25 in Illinois. "Living on $8.25 is constantly one sacrifice after another sacrifice," said Janah Bailey, a McDonald's worker. "It's not right that a majority of us are relying on public assistance to be able to eat or go to the doctor when these corporations make billions of dollars every year. It's time for people to speak out because these corporations just keep getting rich off our labor." The advisory referendum is nonbinding, but Action Now Executive Director Katelyn Johnson expected it to exert political pressure, calling it the "first step to a larger campaign." Johnson said she expected the issue to surface in the City Council, adding, "We have so many aldermen behind us ready to make that happen." Other aldermen pledging their support included Jason Ervin (28th), Bob Fioretti (2nd), Leslie Hairston (5th), Joe Moreno (1st), Ricardo Munoz (22nd), Nick Sposato (36th) and Scott Waguespack (32nd). Action Now was joined by the community groups the Brighton Park Neighborhood Council and the Grassroots Collaborative, as well as the SEIU Healthcare Illinois union organization. According to Patel, the 103 precincts where the referendum will be on the ballot reflect a diversity of neighborhoods on the North, West and South sides where community groups had the resources to collect the required number of signatures. The aldermen joined in a news conference on the issue at the Chicago Temple, the same week President Barack Obama and Gov. Pat Quinn both called for a hike in the minimum wage in their State of the Union and State of the State speeches. Johnson said their call for a hike in the minimum wage to $10 was insufficient and that, accounting for inflation, $15 would bring it back in line with what it was when it was first created in the '60s.